You may not have yet heard of Venus in Fur, the play currently in production at the Auxillary Dog Theatre, right? Written by David Ives, the two-person play opened off Broadway in 2010, on Broadway in 2011, received 2 Tony nominations (for Best Play and Best Actress in a Play), and is just now having its first round of regional showings. 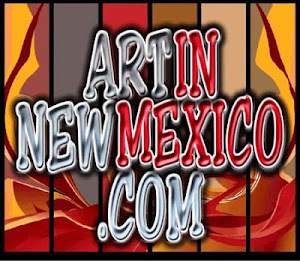 As a self-professed champion of new art, it pleases me so very much to review this show. Set in present day New York City, Brennan Foster introduces us to his character Thomas, the playwright and director who laments the need to audition yet another dingy actress for his show. Vanda, who is auditioning for the part of Vanda, played brilliantly by Sheridan Kay Johnson, enters and immediately allows her comedic elements to keep the pace upbeat. As the two begin to read from the script for her audition, complete with numerous onstage costume changes for both actors from Vanda's seemingly never-ending bag, more subtle aspects of the story begin to come forward. Ives pulls from literary sources to create the play within the play, most prominently the novella Venus in Furs, by Leopold von Sacher-Masoch (whom we derive the word masochism from). As such, dominance and submission are prominent themes in every time period we are steered through, but more often in a subtle and non-sexual context than as a by product of desire. Feminist messages are certainly part of the text as we watch the two change collars, and change positions of dominance, alternatively taking control of the situation and giving direction to one another, however there is a playfulness that sustains the larger questions of gender equality which surface. A "phony continental accent" is directly referenced, allowing the accent as well as the dialect to shift, a feat which can be painful if not done well, and these two handled their characterizations quite well and often with extraordinarily funny moments. As modern day and 1870-something come in and out of focus, a greater range is provided for the actors to navigate, and both have strong soliloquy moments as well as light hearted dilagoue to find together. The choice of no intermission allows the show's momentum to build and the end leaves the audience feeling electrified and wondering what exactly they've just witnessed. "Don't F@!% with a goddess!" is the take away line, and as you might guess, the show is definitely rated R. Saucy, provocative, and raucous, the two play together brilliantly and their ability to sustain each other, with no exits and only each other to work with, allow the pace to flow and, ultimately, crescendo. Directed by Kristine Holtvedt, and costumed by Jaime Pardo, the show was championed by the Aux Dog's Producing Artistic Director, Victoria Liberatori who is expanding events at the theatre as well. "Friday Night Live" improv shows are happening at 10:30, after the main performance. Get to the Aux Dog this weekend, you have until Easter Sunday (!) to catch the Southwest regional premiere of this show and you can always get tickets and info on their website, www.auxdog.com. Remember that movie The Birdcage with Robin Williams and Nathan Lane? Most everyone does, but did you know the musical comedy "La Cage aux Folles" was the movie's original inspiration? 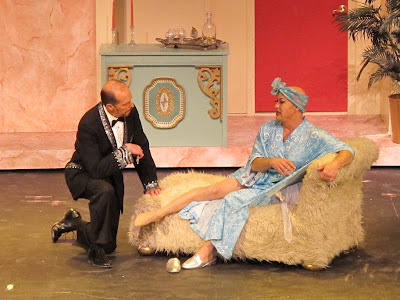 Like the screenplay, the stage comedy currently running at the Albuquerque Little Theatre revolves around a gay couple, Georges and Albin, whose son Jean-Michel wishes to marry Anne, daughter of a political conservative who seeks to shut down drag clubs. One invitation to dinner later, and the complications ensue. Ron Bronitsky's Georges finds himself trapped between his love for his child, as well as his devotion to his partner, Albin, whom he is asking to disguise his true self, or simply to disappear. As Albin, Dean Eldon Squibb must find the nuances between love and betrayal by the family he loves, while still being the great performer Zaza that the people demand. As their foils, the conservative Dindons' bombastic rigidity, played by Rick Huff and Carolyn Hogan, allows the preposterousness of hiding who you are to be seen. Throughout the show, the message of being true to one's self is emphasized in both script and song, despite the paradox we each live when we disguise ourselves by putting costumes over our authentic personality. As true in metaphysics as it is in theater, "We are who we are, and who we are is an illusion." Not to be forgotten are Les Cagelles, the nightclub's showgirls, an energetic ensemble of talent led by Jonte Culpepper, as the ferocious Hannah, and her team of fabulosity, James Camacho, Joey Grider, Andrew Melendez, Ty Shoemake and Roan Velasco. 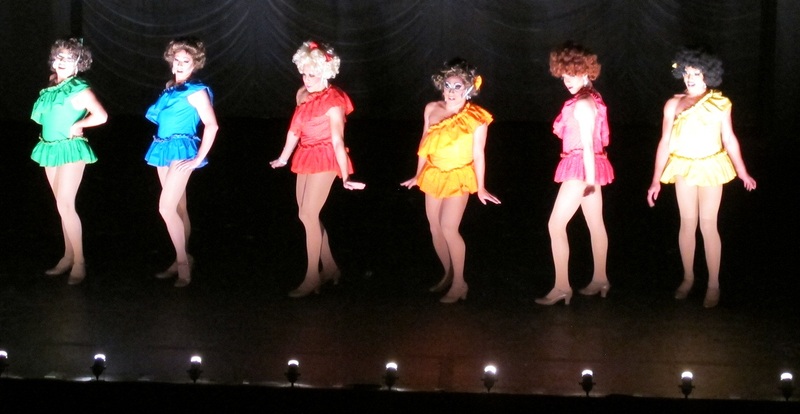 Energizing the pace of the show, the Cagelles' costumes and choreography dazzle and delight. Directed by Henry Avery, with choreography by Larry Aguilar and musical direction by HollyBeth and William Williams, the expert guidance behind the scenes shines through in each actors' performance before the audience, who gladly ended the night cheering on their feet. Currently in their 2nd week and closing on March 24th, that means you still have time to catch this show, as well as a bonus Thursday performance on March 14. The show is rated PG-13. 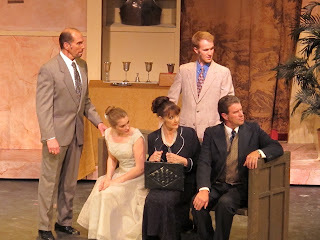 Check www.albuquerquelittletheatre.org for prices and online ticket sales.